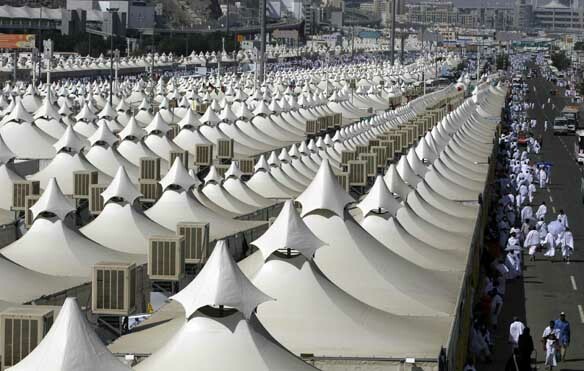 How should a person prepare for Hajj? Once a person has intended Hajj, he should repent from all his sins, the big and the small, and he should return the peoples’ property back to them. He should appoint someone to take care of his work that he leaves behind and guarantee that his children and family have what they need from his property. He should take with him from his wealth enough to take care of his needs while he is journeying so that he does not have to depend on others. Most importantly, he has to be careful that this wealth has been attained through halal means. He should also try his best to find the company of a righteous friend who will help him in his Hajj; guiding him if he gets lost and reminding him if he forgets. Finally, he should renew his intention and seek the pleasure of Allah in all his deeds; and try his best to beautify his character and manners with the people so as not to fall into dangerous deeds such as backbiting and anger that destroy good deeds. If a person falls into one of these actions, there are specific deeds such as Fidyah that he must offer as compensation. The Ihram is the first rite of Hajj; it is an intention that the Muslim makes before performing the Hajj. The wisdom behind the word “Ihram” is because after this intention, the halal actions which the Muslim enjoyed become haram for him (such as perfuming, wearing different types of clothing). It is important to mention that avoiding stitched clothing before the intention of Ihram is SUNNAH, while it is WAJIB (obligatory) to avoid it after the intention. Also, the Ihram is not just physical preparation as mentioned earlier, therefore, his Ihram is not complete by just avoiding stitched clothing and taking a bath, rather, it is by intending the rites of Hajj and avoiding sins that his Ihram is complete. The next and final post in the “Rites of Hajj” will be an explanation of the three types of Hajj in a more detailed way, plus a short summary of common mistakes people make in their Hajj that may affect the perfection of the worship and a woman’s attire during Hajj.